Electromagnetic solenoids in today's industry play a very important role, it can be said of a basic electrical appliances. As technology advances and competition intensifies, people not only the quality requirements of the solenoid becomes higher, the efficiency of their work is a higher demand, therefore, high-quality, high efficiency drive under China's magnet has been a large degree of progress, but also stimulated the manufacturer and professional development of researchers passion. More types of electromagnetic solenoids including lifting magnet traction solenoid, push-pull solenoid, frame solenoid, tubular solenoids, rotary solenoid, keep solenoid, two-way corner magnet, suction-type electromagnetic iron, wet magnet DC, AC wet solenoid valve, embroidery machine solenoid, magnetic suction cup, magnet corner electromagnet and so on. 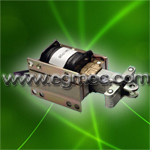 Electromagnetic solenoid has been very widely used contain virtually all industries, such as aerospace, machinery, metallurgy, mining, shipbuilding, power electronics, coal, mining, power tools, transportation, lifting and transport, household appliances, electrical, locks, Textile, game consoles, medical equipment, fitness equipment, office equipment, vending machines, smart toys, building materials, chemicals, plastics, glass, ceramics, cement, paper, etc.